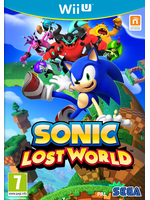 Sonic Lost World is available for PC starting today with HD resolution, gamepad support and other Steam features. Cool! It actually looks really really good! "Full HD" "60 FPS"...lol, they considered that as advertisement credentials for PC. It's been a standard dating decades ago to have frame-rate and resolution unlocked. It looks pretty good, as good as generations. Don't know what the reviews say about it though. it sure does bring out my inner Teen/childhood. Deos look pretty good. Why the hell is this on PC? Yeah, I'm kind of confused, who this is for. I also wonder if they're going to bring out other Sonic games from the Wii, too? Sonic Colours? What about that last bomb? I kind of wanted to try it, but couldn't be bothered to have a Nintendo platform to try it.